Geoff, or “Sticky” to his mates, and Sam met at school in Launceston 12 years ago and have been best friends ever since. 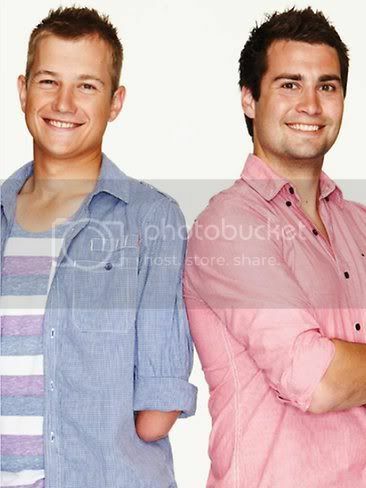 TWO Tasmanian men will star in the new series of The Amazing Race Australia. Launceston flatmates Geoff Stick and Sam Hay, both 24, will feature on Series Two of the travel-adventure show, which will soon screen on Southern Cross. The two met at school 12 years ago and have been best friends since. They not only live together but also play in the same cricket and football clubs and applied for The Amazing Race Australia because they thought their strong bond and easygoing personalities would stand them in good stead for winning the show's $250,000 first prize. Stick, who was born without a left forearm, was also keen to highlight the capabilities of people with disabilities. "I just want to prove to myself and anyone who has ever doubted me that my arm won't stop me from doing anything," Stick said. Hay said Stick was "just an inspirational bloke". "He's better than me at just about anything, including with the ladies," he said. They are one of 11 teams in the new series, in which contestants do activities such as skydiving, rafting and bungy jumping while racing around the world. I think It's more interesting. MET at school 12 years ago and have been best friends since. Sticky was born without a left forearm but still competes in the same cricket and football clubs as Sam. “Sticky’s just an inspirational bloke. He’s better than me at just about anything, including the ladies,” Sam said. The boys are determined that nothing will hold them back on the Race. “I just want to prove myself and anyone who’s ever doubted me that my arm won’t stop me from doing anything,” Sticky said. These flatmates also compete together in the same cricket and football clubs – no mean feat given Sticky was born without a left forearm. “Sticky’s just an inspirational bloke. He’s better than me at just about anything, including with the ladies!” says Sam. And the boys are determined that nothing will hold them back on the race. “I just want to prove to myself and anyone who’s ever doubted me that my arm won’t stop me from doing anything,” explains Sticky. These sports-mad mates have both competed at an elite level. Sticky trained in javelin at the Australian Institute of Sport and is hoping to be selected in the Australian Paralympic team, while Sam has played grade cricket. And look out ladies – both Sam and Sticky are single and on the lookout for love. “It’d be great to find love on the show,” says Sticky. The boys believe their easygoing nature will also stand them in good stead on the race. And it's awesome to have a Tasmania team!!! Correct me if I'm wrong, but if I remember correctly, we didn't have a Tasmania team on the first race, did we? Surely the meter of their taxi said 176.50 not 1.765,00?? None of the other teams ran into that much trouble with their taxi fares and it seems unlikely TAR would give them a rediculous budget compared to the local prices, i.e. one to not even cover a cab fare? The taxi driver said : How many hours? He probably thought they were chartering him for 2000 Philippine pesos? I don't think he meant to rip them off, it was probably more a misunderstanding but it wasn't corrected. I hope they won't make these sorts of mistakes again though. Would be a shame if they got out because of one of these mistakes, and this could have easily cost them the race if it hadn't been for the free ride they got. Pleased to see them win, especially after the clear disadvantage Sticky had with the pull-task. Maybe he should have thought about that one a bit more before choosing it. Lucky for them no fatal mistakes here. Seems like a likeable team sofar so among my fave's. they're strong and they've got a sense of humour about them, a team worth rooting for! Yes, this is one of my fav team too! Let's kick some butts, like the alphas! I have a feeling that they will get eliminated because they got lost. I hope this isn't a spoiler of sorts? Btw that scene with those transvestites was very funny. 'They were two.. two.... * sticky interjects* blokes..
.. and they were rubbing us a bit..
Yeah 'she' wasn't bad looking, I won't lie'. Just thought Sticky & Sam needed more love. I'm liking them more each week!